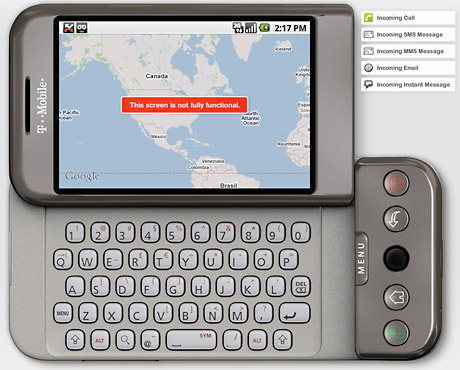 Don’t expect too much … the online emulator gives just a first impression of the look-and-feel of the first Android-smartphone. The mobile, manufactured by HTC and equipped with the Android-OS created by Google and the Open Handset Alliance, will enter the US market in the end of this month. It’s fun to play around with the user interface within the emulator created in Flash. Although you find the warning “This screen is not fully functional!” still on many screens – it’s the absolute right step in a new form of customer communication: Customers should not by the G1 because of the datasheet-facts – but because of the user interface and the additional functions. Finally it’s more “selling a great user experience” and no more “selling-nice-looking-hardware”. Great news for mobile application development!